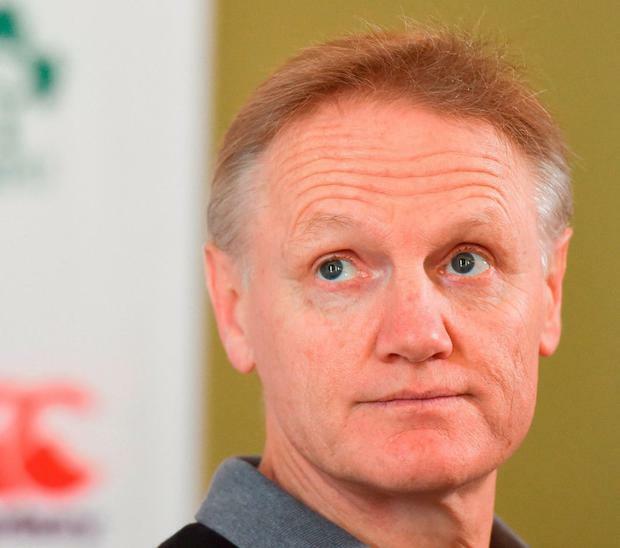 Joe Schmidt is asked if he is daring to dream of what may come tomorrow and soon he is talking of nightmares. The Ireland coach described himself as a "glass-half-full" character, but there is a fear of failure at the back of his mind, a worry that if his Six Nations champions do not bring their 'A-game' to Twickenham that they'll be blown away by an English team reacting to their successive defeats to Scotland and France. And yet, amid the fretting, there was a warning too for Eddie Jones and his side, an assessment of the myth of the backlash and how far emotion can take you at the top level. Tomorrow's game is a clash between the world's second and third best teams, the margins will be as fine as ever and the stakes are high. Schmidt always keeps an eye on the markets before his team's matches and will have noted that the bookies have this down as a scratch game. Only the All Blacks arrive at Twickenham as favourites, but his side have earned their right to go to London with expectation. Handling it is the next step. He has reason to be confident in his team after making just one tactical change from the side that beat Scotland, rotating Iain Henderson in for Devin Toner, while Jones has hit the panic button and changed seven from his side's loss to France. His rival is immersed in a crisis largely of his own making; by all accounts he was in tetchy form at his own team announcement after his video nasty forced him into the uncomfortable position of having to apologise on Wednesday. In contrast, team Ireland are able to rise above. Even the presence of assistant referee Marius van der Westhuizen at England's Tuesday training session was greeted with mere surprise, although World Rugby later stood him down in the interests of fair play. Unsurprisingly, Schmidt largely steered clear of all of the furores that surrounded tomorrow's opponents and the match-day officials, offering an Arsene Wenger-like 'I haven't really read them' response to Jones' ill-judged comments about Ireland and Wales. Instead, his focus was firmly on the task ahead and the prize at stake. "I don't know about the players, but I would be very much a glass-half-full person," he said. "I get excited about the group we have and how hard we work, but I'd be very balanced from the perspective of being a pragmatist at the same time. "There is no point in dreaming beyond this Saturday, because this Saturday is a finite point for us where a number of things have to happen and go right. "I wouldn't say that you can control that emotional roller-coaster that preparing a high-level sports team kind of engenders, because there are times where you inevitably imagine the worst-case scenario. Worst-case scenario is that England hit the ground running and they actually win with a bit to spare. That would be a bit of a crushing scenario. It would be a crushing way for us to finish a year of being unbeaten. "A potential opportunity that has only been done twice before, I'd be more motivated and scared by that than thinking about how fantastic it'd be to do something that would be another step for this group into kind of stretching themselves beyond what they've done before." During his press conference Schmidt made a passing, pointed reference to TV3 pundit Matt Williams' assessment of his side as "boring", but he accepted that a win of any hue would do. "I don't think any of the team would care if it was 3-0," he conceded. "I don't think we would be uninspired by a 3-0 victory, we know what's at stake. "And what's at stake is a fantastic opportunity, not just to achieve a Grand Slam, but to go a year unbeaten. We wouldn't have dreamed of that this time last year. This time last year we were scrambling, we thought Conor (Murray) was going to play on the Thursday and Kieran Marmion came in, did superbly. Jared Payne played his only game of the Six Nations. "That character reference that we have from that group has helped us build from there on. And hopefully we can continue to build on that. That would be special for us in all sorts of ways, because of what is at stake." The boring tag must be incongruous to a coach whose team has scored 17 tries in their last three games to secure a third title in five seasons. They have dominated possession and territory in all of their games and will look to be as positive as possible from the off. He knows that an English backlash is coming. He has too much respect for the 2016 and 2017 champions to read too much into their recent dip in form.But, he also warned, that passion can only get a team so far at this level. "Your passion and emotion drives you forward in a game. It makes you as determined as you can be," he said. "But it has a lifespan in a match, there's got to be something that's contagious about getting you further motivated during a game. "For us, we were lucky last year, because it was three-all, we went up 10-3 and that first try that got scored was the only try of the match in the end. "Getting that try in the first quarter, that sparked a bit of confidence and a real determination that, if we could stay in front, obviously you get the result at the end of the day. "That passion and determination, it's got to be balanced with a degree of confidence and a degree of building through the match. Not just, 'Right we're going to be passionate at the start', because that will start to fall off if things go against you and you're under pressure the whole time because mentally it is very hard to stay up all the time." On top of all that, he reckons good fortune will also play a part. "Not only does it have to be a really good performance," he said. "Even Alex Ferguson said, 'You want to put all those good things together and they you just need an ounce of luck when it comes to those really big games'."